The rotating direction is shown from the engine front. Remove intake manifold. Refer to EM-27, "Exploded View". Remove rocker cover. Refer to EM-12, "Exploded View". Remove timing chain. Refer to EM-48, "Exploded View". Removal of oil pump drive related part is not necessary. Remove camshaft position sensor (INT) and camshaft position sensor (EXH) from camshaft bracket. 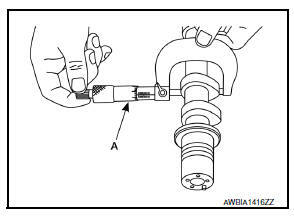 Handle camshaft position sensor (INT) and camshaft position sensor (EXH) carefully and avoid impacts. 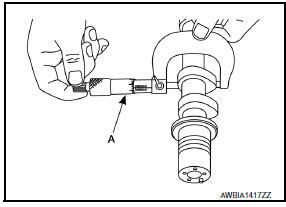 Do not disassemble camshaft position sensor (INT) and camshaft position sensor (EXH). Do not place sensor where it is exposed to magnetism. Put painted matching mark (A) on the camshaft sprocket (INT) (2), camshaft sprocket (EXH) (3) and the camshaft bracket (1) as shown. When camshaft alignment is as show in installation, it prevents the knock pin of the camshaft (INT) from engaging with the incorrect pin hole when installing the camshaft sprocket (INT). Remove camshaft sprockets (INT and EXH). Secure hexagonal part (A) of camshaft using suitable tool. Loosen camshaft sprocket bolts and remove camshaft sprocket. 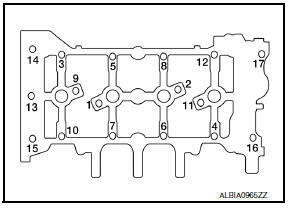 Do not rotate crankshaft or camshaft while timing chain is removed. It causes interference between valve and piston. Do not loosen the bolts with securing anything other than the camshaft hexagonal part. Loosen bolts in reverse order as shown. tool, and then remove the camshaft bracket. Do not damage the mating surface. Do not use suitable tool anywhere other than shown, sealant used is more adhesive than previous types when shipped. Identify installation positions, and store them without mixing them up. Remove signal plate from camshaft, if necessary. Install them in the original positions. Clean camshaft journal to remove any foreign material. Distinguish between the intake and the exhaust by looking at the different shapes of the front and rear ends of the camshaft or using the identification colors (A) and (B). Install camshafts so that camshaft dowel pins (A) on the front side are positioned as shown. 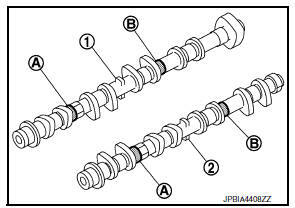 Though camshaft does not stop at the positions as shown, for the placement of cam nose, it is generally accepted camshaft is placed for the same direction as shown. Remove foreign material completely from camshaft bracket backside and from cylinder head installation face. 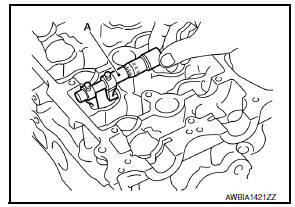 Apply liquid gasket (A) to camshaft bracket as shown. Do not fill the engine with oil for at least 30 minutes after the components are installed to allow the sealant to cure. Tighten bolts of camshaft brackets in the following steps, in numerical order as shown. There are two types of bolts. Refer to the following for locating bolts. Tighten bolts to the specified torque in three steps in the order as shown. After tightening bolts of camshaft bracket, be sure to wipe off excessive liquid gasket from the mating surface of cylinder head. 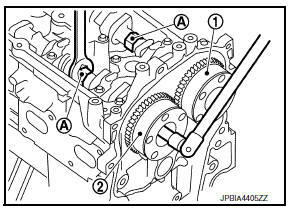 Install the camshaft sprocket to the camshaft with the following procedure. When the camshaft sprocket (INT) (2) and camshaft sprocket (EXH) (3) is installed, refer to the paint matching marks (A) made during removal. Securely align the knock pin and the pin hole, and then install them. Tighten bolts in the following steps. Secure the hexagonal part of camshaft using suitable tool to tighten bolt. 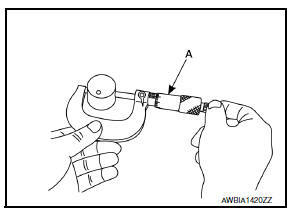 Check the tightening angle using Tool (B). Do not judge by visual inspection. Install timing chain. Refer to EM-48, "Exploded View". Inspect and adjust valve clearance. Refer to EM-20, "Inspection and Adjustment". Installation of remaining components is in the reverse order of removal. Put V-block on a precise flat table, and support No. 2 and 5 journal of camshaft. Do not support No. 1 journal (on the side of camshaft sprocket) because it has a different diameter from the other four locations. Set suitable tool (A) vertically to No. 3 journal. Standard and Limit : Refer to EM-119, "Camshaft". If it exceeds the limit, replace camshaft. Measure the camshaft cam height using suitable tool (A). Measure the outer diameter of camshaft journal using suitable tool (A). Standard : Refer to EM-119, "Camshaft". Tighten camshaft bracket bolts with specified torque. Refer to EM-60, "Removal and Installation". Measure the inner diameter of camshaft bracket using suitable tool (A). If it exceeds limit, replace camshaft bracket. If it exceeds the limit, replace camshaft or cylinder head, or both. Camshaft bracket cannot be replaced as a single part, because it is machined together with cylinder head. Install camshaft in cylinder head. Refer to EM-60, "Removal and Installation". Install suitable tool in thrust direction on front end of camshaft. Read the end play on suitable tool (A) when camshaft is moved forward/backward (in direction to axis). Measure the following parts if out of the standard. 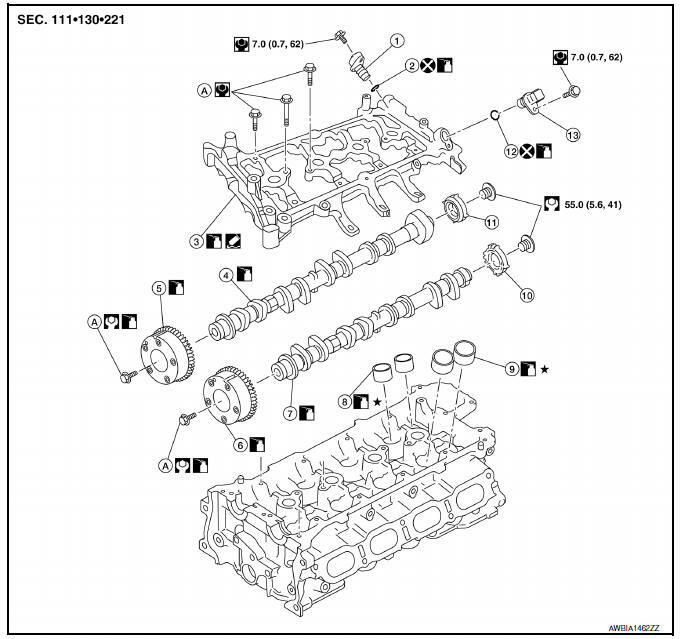 Refer to the standards above, and then replace camshaft and/ or cylinder head. Put V-block on precise flat table, and support No. 2 and 5 journals of camshaft. Measure the camshaft sprocket runout using suitable tool (A). Limit : Refer to EM-119, "Camshaft". If it exceeds the limit, replace camshaft sprocket. 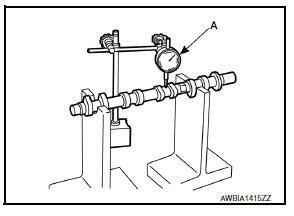 Check if surface of valve lifter has any wear or cracks. If anything above is found, replace valve lifter. Refer to EM-119, "Camshaft". Measure the outer diameter of valve lifter using suitable tool (A). Measure the inner diameter of valve lifter hole of cylinder head using suitable tool (A). If out of the standard, referring to the each standard of valve lifter outer diameter and valve lifter hole diameter, replace either or both valve lifter and cylinder head. Check when engine is cold so as to prevent burns by the splashing engine oil. Perform this inspection only when DTC P0011 or P0014 is detected in self-diagnostic results of CONSULT and it is directed according to inspection procedure of EC section. Refer to EC-171, "Diagnosis Procedure" (P0011) or EC-174, "Diagnosis Procedure" (P0014). Check engine oil level. Refer to LU-7, "Inspection". Perform the following procedure so as to prevent the engine from being unintentionally started while checking. Release the fuel pressure. Refer to EC-143, "Work Procedure". Disconnect ignition coil and injector harness connectors. Support the bottom surface of engine using a transmission jack, and then remove the engine mounting bracket (RH) and engine mounting insulator (RH). Refer to EM-82, "M/T : Exploded View". Remove intake or exhaust valve timing control solenoid valve. Refer to EM-48, "Exploded View". 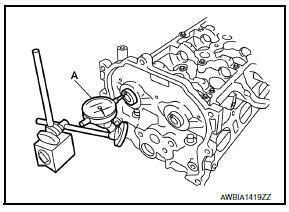 Lift the front side of the engine with a jack base to remove intake or exhaust valve timing control solenoid valve. Clean the mounting area of intake or exhaust valve timing control solenoid valve, and then insert a clean shop cloth with no oil adhesion into the oil hole of the cylinder head. 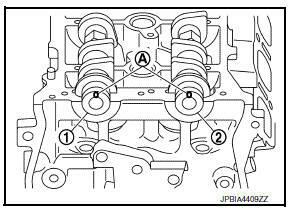 Perform cranking to check that engine oil comes out from the oil hole (mounting hole of intake or exhaust valve timing control solenoid valve) of cylinder head. Regarding the engine oil check, judge it by the amount of oil adhered to the shop cloth inserted into the oil hole. Do not insert fingers into the oil hole. Be careful not to touch rotating parts (drive belt, idler pulleys and crankshaft pulley, etc.). Do not perform cranking without installing the engine mounting insulator (RH) and engine mounting bracket (RH). Prevent splashing by using a shop cloth so as to prevent the worker from injury from engine oil and so as to prevent engine oil contamination. Prevent splashing by using a shop cloth so as to prevent engine oil from being splashed to engine and vehicle. Especially, be careful not to apply engine oil to rubber parts of drive belt, engine mounting insulator, etc. Wipe engine oil off immediately if it is splashed. 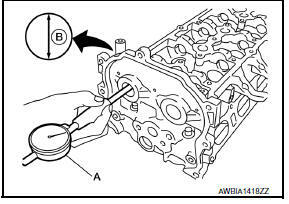 Perform the following inspection if engine oil does not come out from intake or exhaust valve timing control solenoid valve oil hole of the cylinder head. Clean oil groove between oil strainer and intake valve timing control solenoid valve. Refer to LU-6, "Engine Lubrication System Schematic". Remove components between intake or exhaust valve timing control solenoid valve and camshaft sprocket (INT) or (EXH), and then check each oil groove for clogging. Clean oil groove if necessary. Refer to LU-6, "Engine Lubrication System Schematic".